If you strain at gnats you can usually find them or, searching even more closely, gnats’ gnats or smaller. All you need is a fine enough sieve. Same with fine-grained Offense Filters, which seem to be selling well this past year. 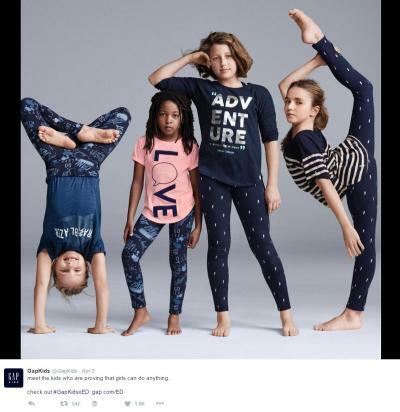 The latest to learn the lesson is Gaps Kids, in early April, when it found itself embarrassed into taking down an image from an ad campaign for Ellen DeGeneres’s clothing line for kids. But it’s harder to stake a claim that it’s “objectively” offensive. After all, these are members of a children’s circus troupe. They are flexible and can sustain many poses. That’s what they do. Why does the white girl have her arm on the other girl’s head? Because the other girl is shorter. Does that show white dominance? Well, obviously to some. But maybe it also shows the plucky short girl serving as Atlas: shoring up her compatriot. Maybe it shows racial solidarity: all for one and one for all. And suppose the picture had been the other way around: say, black girl sitting on white girl’s shoulders. Would the critic then complain that such a picture asserts that black girls can’t walk, or hold themselves up, or need to be carried? Is there any possible picture or configuration that would withstand the sort of offense strainer that your average American uses on a daily basis? Perhaps if there had been no black girl in the picture? But then, it’s racist, segregationist, exclusionary. Or equally black and white? But that’s obviously “fake”: it doesn’t mirror proportions in the general population. Or all black? But is someone trying to say that the clothes aren’t fit for a white audience? Or more black than white? Which manifests an attitude that blacks can’t do it on their own? And where are the Asian kids – and boys? (Oh, didn’t mean to offend anyone: or Hispanics?) Move, countermove, checkmate. No doubt, that is, if it’s “men” and “women” who are in the same space. But what is a “man-identified” or “woman-identified [person]” other than the high parody approach to avoid someone taking you to task for condescendingly denoting a generic type (“man” or “woman”) as if it’s (one hesitates to say “he” or “she” is) real. Gender is (but you know this) a “social construct,” so it must be offensive to point to a mere “man” or “woman,” even if to no one in particular, as if such a being is “really” a man or a woman, when the “anatomical” man might really be a woman or vice versa. Hence the trope of the “woman-identified woman,” a semantic form that traces back more than four decades. But even if there is some faint reason to use a phrase showing that the writer knows that some women aren’t identified as such by women, it passes beyond all understanding to suppose that there is utility in the concept of a “woman-identified person” (except, of course, to avoid the remotest possibility of having to apologize to someone for the offense of saying “man” or “woman” as if there’s only one kind of each). A woman who identifies herself as a person? Does she have a choice to be other than a person? A person who identifies herself (himself) as a woman (or man)? Or who is identified as a woman (or man)? But in the context of Ms. Sanders’s statement, what difference could it make whether the someone is a person whom someone else has identified as a woman (or man) or even a person identified by herself or himself as such a one? Or, I suppose, we could blame it all on the English grammatical passive. This entry was posted in Our Blog, Previous topics on April 17, 2016 by JKL.